This Applaws wet food is a tasty meal for your cat. This natural food contains only 4 ingredients: chicken breast, boiled water, cheese and rice. This food is also naturally rich in taurine. Available in tins of 70 and 156 grams. 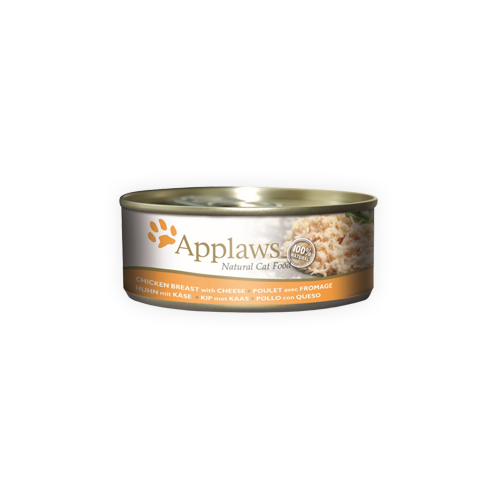 Applaws formulated this tasty and natural food specifically for adult cats. It is packed with chicken breast supplemented with cheese and rice. The wet food is also a natural source of taurine. This ingredient supports the condition of the eye and is beneficial for the heart. The cat food only contains 4 ingredients and is free from added nutrients. Fresh fish, fresh meat and no artificial colours, scents or flavours; Applaws only uses natural ingredients originally meant for human consumption in the production of this cat food. The range contains a lot of fresh fish or fresh meat. This results in dry food and wet food that is rich in vitamins, minerals and Omega 3 and 6 fatty acids, which support your pet’s health. Applaws Cat Chicken Breast & Cheese is available in tins of 70 and 156 grams. Chicken breast (70%), boiled water (24%), cheese (5%) and rice (1%). Have you used Applaws Cat Food - Chicken Breast & Cheese before? Let us know what you think about this product.